Atelier Tracy K.: Recycled/Upcycled Christmas/Holidays will be coming next week!! Recycled/Upcycled Christmas/Holidays will be coming next week!! Starting next Monday, October 7th, 2013 I will be posting one Christmas/Holiday Gift DIY idea per day two weeks. I may add more days at the end but I don't want to exhaust myself so I think two weeks is doable. Since my family has a variety of religious beliefs I called it Recycled/Upcycled Christmas/Holidays. I want everyone who has a gift to give this season (and really whenever!!!) to be able to DIY for less. I am a big fan of using what I have because I really have no other option if I want to be creative and I want to share. 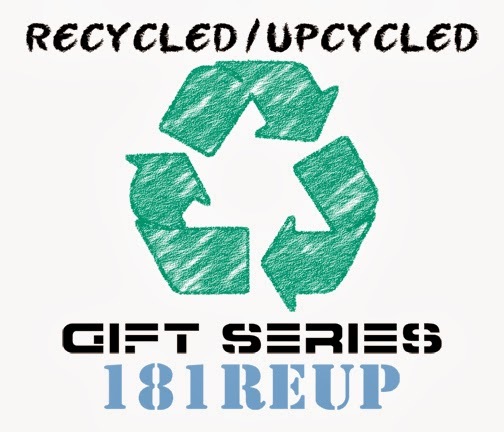 If anyone out there in the World has a super Recycled/Upcycled DIY Gift idea please feel free to leave a comment or hit the contact button and send me an email. I would love to hear from someone. Here is the code for a clickable button if you want to put it in your sidebar. I would love it if someone shared it for me lol :) Just copy and paste it. Well life got in the way of this series and so did my lack of planning. I am going to edit it and say November 1st to November 15th. So wish me luck and please come back regularly to check out what I've created and shared.